One of the loveliest breeds that you may not yet be familiar with is rapidly emerging in popularity. It's the Cavalier King Charles Spaniel (CKCS), and it's one of the most popular breeds in Great Britain. Since 2000, the CKCS has grown in popularity and in 2013 was the 18th most popular pure-breed dog in the US, according to the AKC. Unfortunately, CKCS are susceptible to abnormalities of heart valves on both the right and left side of the heart, most significantly an abnormality of the mitral valve called mitral valve insufficiency. Mitral valve insufficiency is a common development in many breeds, specifically middle age and older dogs. In CKCS it is considered to be an adult onset congenital abnormality. 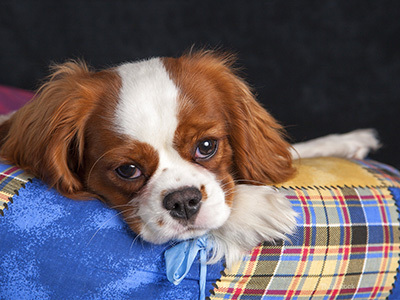 Mitral valve disease and resultant heart failure is the leading cause of death in CKCS and they are 20 times more prone to have the disease than other breeds, according to the Cavalier King Charles Spaniel Club. Adhering to breeding limitations is recommended due to the grave nature of the disease and the fact that the condition does not manifest itself in many cases until adulthood. The Cavalier King Charles Spaniel Club says, ideally dogs should not be bred until they are at least 5 years of age. A secondary recommendation necessitates that both parents be certified as free of detectable abnormalities at 2 1/2 years of age. Tragically, the disease is not only pervasive in CKCS but also progressive and generally fatal. Once clinical signs such as difficulty breathing and/or accumulation of fluid in the abdomen develop the prognosis worsens. Once heart failure develops medical intervention consisting of a combination of drugs can, for a time, control clinical signs. Early asymptomatic cases do not benefit from medical intervention and cardiologists do not advocate for treating asymptomatic dogs. Once clinical signs develop, management and treatment become controversial even among cardiologists. A veterinary cardiologist should evaluate affected dogs regularly. Treatment should be under the supervision of a veterinarian current and familiar with various modalities. Unfortunately, this is a common, inherited and progressive condition that is still being studied by experts with little clear direction on how to eradicate or treat this killer.